The Pattern Language is at the core of our Workshop and the "Handbook" that should result of it. It follows the method outlined by Christopher Alexander in architecture. What is a Pattern ? And why a Language ? A Pattern is a recurrent solution to a problem or a set of problems that has proven to be effective in solving that problem. How Do you describe a Pattern ? a pattern is basically described as a four-part construct. First comes the' 'context' - the conditions under which this pattern is called for. **For example: Enabled by the potential of new media and the threat of rural decay we want to build videobridges as a universal education system for disadvantaged areas. ** Patterns never exist out of context, the context provides the problem and in general also the material of the solution. A good solution is mostly local, available under even unfavorable conditions, easy to omplement, durable, maintainable. ** For example: To bring computers to an African village might be an out-of the context solution unless there is training and maintainance capacity. Next is the' 'problem' or 'goal' , the challenges by the context which respresent a "system of forces" that need to be dealt with. ** For example: How do we solve the problem of getting ongoing support for videobridge events? The third part is the 'solution' - a configuration that balances the system of forces or solves the problems presented. A pattern is an evolutionary proven solution that creates optimum results in a defined situation. ** For example: Support by Networking, leveraging the task by creating a set of connections in form of an Association of Learning Places. ** If you arrive at a solution, NAME it, DESCRIBE it, VISUALIZE it. Be aware that for a solution to work, you might need additional patterns. Try to list them. Go on and see if the solution is elegant, sustainable and proven. They are more than a list of solutions; they are more than a systematical collection of solutions; they are a generative repository of the building blocks of an indefinite number of good design possibilities. What is this Pattern Language about? 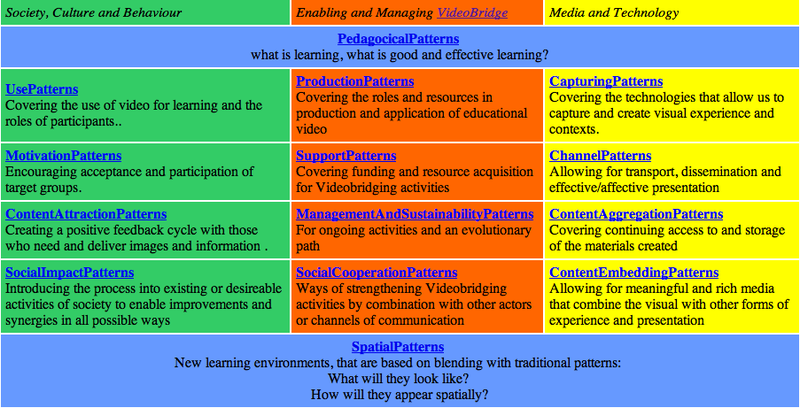 This pattern language is about video bridging, about the connection between local learning communities by broadband video helping to expand and enhance learning opportunities. The idea behind this is that by these learning the possibilities of local environments can be enhanced, thus increasing sustainability and quality of life. Global communication adds a crucial layer to local environments and has also the potential to reeinforce their essential potential of physical proximity and interactivity (Although in the world of today global communication is still mostly disruptive - thats why we need to learn to do it right). VideoBridge is a method to optimise global communication by broadening experience and understanding of local learners with the help of visual media and synchronicity. The societal one that encompasses problems and solutions that are based on the social, cultural, conceptual, cultural, psychological and ecological environment to the learning process that we seek to optimise, including the question what is learning, for whom we a learning etc. The systemic patterns encompass everything that needs to be considered to assure the sustainability, quality, accountability, manageability, vitality and integrity of the process of videobridging itself. The media pattern dimension encompasses the technical tools and their good use, from capturing/refining to disseminating, aggregating and meaningfully embedding content. None of these dimensions can exist without the others, they are constitutive for each other, yet they can be clearly identified and help us to not only reduce, but rather understand the complexity of solutions. Since within every dimension there is a development from the core act to the success aspect, from the success aspect to the sustainability aspect and from the sustainability aspect to the meaningfulness aspect, we will start with a /Matrix of 12 pattern groups. A pattern should be identifiable in a systematic collection of patterns by belonging to a pattern group, often indicating alternative settings and various aspects of solutions. A pattern should have a clear, telling, identifiyble NAME, and if possible, a compelling visiual representation that the mind can grab and work with. A pattern should include a description HOW the problem is solved. A pattern should indicate SEQUENCES of preceding and following patterns that comprise the context for wholistic sustainable design.